Hi Friends! I hope everyone's staying warm in this freezing weather. Looking out the window, you'd never guess it's the 1st of March tomorrow! Before we begin the next month, let's take a look back at February. I'm asking myself the same questions I asked myself last month: what went well this month and where is there room for improvement? Having concluded our February budget, I can easily reflect on these questions. The only area of our budget that we really overspent on was our restaurant budget. Any time we eat outside the home, it goes in to the restaurant budget (makes sense, right?!). This month we ate out twice: one was a planned meal out with the in-laws as their belated Christmas present and the other was not planned, but completely worth it when my sister-in-law visited. No biggie but I had to move some funds around this evening while completing our February budget in preparation for March. What went well? I managed to sell £87 worth of the girls' toys and clothes which was put in their University fund. We also sold a fan heater for £10 which was added to the House Expenditures Fund. Also, we came in about £27 under budget with groceries - another month under budget. I'm quite chuffed with this! I used to spend easily £400-£450 every single month when I was working at Sainsbury's, even with my 10% colleague discount. Now that I don't work there, I'm spending about £100 per month(!!!) less because I'm shopping mostly at Aldi. I may have said this last month, but I'm trying to make sure we have a meal made up of leftovers at least once a week and at least two meat-free suppers, too. "Lauren, do you ever treat yourself to anything?" Yep! I bought myself to a small Yankee candle that was on sale for £4.49. Also, Jeff and I got to see The Greatest Showman at the cinema last week thanks to having live-in babysitters (aka. Granny and Granda) and thanks to friends who let us use their Meerkat Movies BOGO voucher code. By the way, if you haven't seen it, do... we were mesmerized every single second of the film. 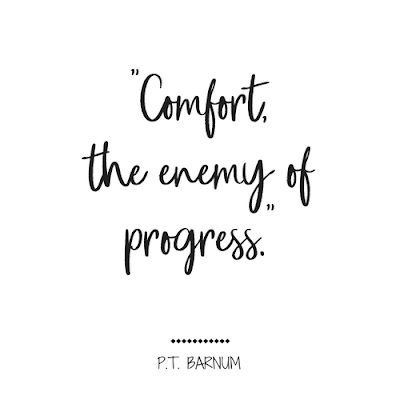 I shared a great quote from the film in the last post I wrote in 2017: "No one ever made a difference by being like everyone else" (although this may only be said in the trailer) Another one... and it could have so easily been missed... "Comfort: the enemy of progress." LOVE THIS! You can only make progress when you move out of your comfort zone. This quote can be applied to any area of life, but since this blog is focused on finances... the only way to achieve your financial goals is to examine your finances, find ways to save, save money, create and follow a budget, save money, plan, save money, make sacrifices and save money.